Fiction – Kindle edition; Penguin; 297 pages; 2014. Lydia is dead. But they don’t know this yet. 1977, May 3, six thirty in the morning, no one knows anything but this innocuous fact: Lydia is late for breakfast. 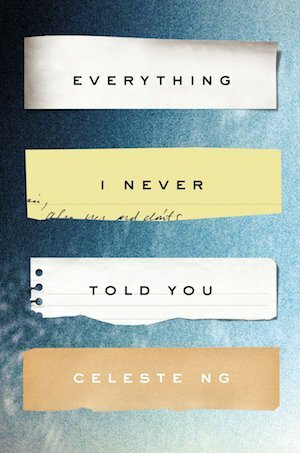 So begins Celeste Ng’s Everything I Never Told You, a novel about the disintegration of a family in the wake of the eldest daughter’s death, which my book group chose for its March discussion. The book is hugely popular — it’s been a A New York Times bestseller, a New York Times Notable Book of 2014, and was named as Amazon’s #1 Best Book of 2014 — and it’s easy to see why: it’s an effortless read and hugely engaging. I wanted to eat it up in one greedy gulp. Despite the tragedy at its heart, it’s a truly compelling story written in prose so polished it practically gleams. The characters are well drawn, if not always likeable, and the author fleshes out their fears and foibles to make them feel (frustratingly) real. But two weeks after having read it, I struggled to even remember the most basic of details — the character’s names, for instance — and had to skim read sections to familiarise myself with it again prior to our book group meeting. This is not to suggest it’s a fluffy read, for it is not, but much like the convoluted title, it’s not exactly memorable. Yet if you had have asked me what I thought of Everything I Never Told You in the immediate afterglow of finishing it, I would have said it was near perfect. Now? I’d describe it as very good — and I’d probably give it four stars. So, what’s the story about? Essentially it focuses on what happens to individual members of the Lee family following the death of 16-year-old Lydia, who drowned in the lake behind the family home. Initially, it’s not clear whether her death was an accident, homicide or suicide, but this book is not a crime novel: it’s an exposé on closely-held secrets, family history, parental expectations, sexual equality, identity, racism and grief. Sometimes you almost forgot: that you didn’t look like everyone else. In homeroom or at the drugstore or at the supermarket, you listened to morning announcements or dropped off a roll of film or picked out a carton of eggs and felt like just another someone in the crowd. Sometimes you didn’t think about it at all. And then sometimes you noticed the girl across the aisle watching, the pharmacist watching, the checkout boy watching, and you saw yourself reflected in their stares: incongruous. Catching the eye like a hook. Every time you saw yourself from the outside, the way other people saw you, you remembered all over again. You saw it in the sign at the Peking Express—a cartoon man with a coolie hat, slant eyes, buckteeth, and chopsticks. You saw it in the little boys on the playground, stretching their eyes to slits with their fingers—Chinese—Japanese—look at these—and in the older boys who muttered ching chong ching chong ching as they passed you on the street, just loud enough for you to hear. You saw it when waitresses and policemen and bus drivers spoke slowly to you, in simple words, as if you might not understand. You saw it in photos, yours the only black head of hair in the scene, as if you’d been cut out and pasted in. You thought: Wait, what’s she doing there? And then you remembered that she was you. You kept your head down and thought about school, or space, or the future, and tried to forget about it. And you did, until it happened again. This desperation to belong — and to keep her parents happy — puts untold pressure on Lydia, pressure that James thinks may have led to her death. But this isn’t just about race, because Marilyn, too, has unwittingly added to Lydia’s burden by pushing her at school in order to become the professional career woman Marilyn was unable to become. The book has a seamless narrative that spools backwards and forwards to focus on individual family members — including Lydia — before and after Lydia’s death. Central to this is the Lee’s marriage, which the author examines in exacting (and compelling) detail, tracing James and Marilyn’s relationship from the moment they met — she was a college student, he was a tutor — until it splinters under the weight of grief. There’s an alarming lack of communication between them — neither knows the other’s innermost dreams or fears or desires. The only thing keeping them together is their children and, in particular, Lydia, who is fawned over as the “favourite” child, the one whom will fulfil their hopes and ambitions. Their other children — space-obsessed Nath, who is never praised or encouraged in any of his intellectual pursuits, and young Hannah, who hovers around the edges, observant but ignored and somewhat neglected by her elders — must battle their grief alone. It might sound like a heart-breaking read — and it is — but Ng pulls back from making it too cloying or sentimental. Perhaps the only faults are that we never quite get to know Hannah as well as any of the other characters — she’s simply a vehicle to observe the family’s breakdown — and the racism/identity theme gets slightly overplayed. But on the whole Everything I Never Told You is an astonishingly mature piece of work for a debut novel. Its precise, often painful observations about our deep need to belong makes it a powerful, heart-felt and intimate read. And I completely understand why so many people have been held in its sway. Interesting comment there that you struggle to remember the characters or other details a few weeks after reading it. With me it was the opposite. When I finished it, I thought: ‘It was OK’. Then, a while later, I started thinking: ‘Actually, it was more than OK, it was rather good.’ Yes, not a perfect novel, but one that has haunted me, with its quiet, understated style. There are two scenes in particular that really stood out for me and became imprinted on my brain: Lydia pretending to chat to her friends on the phone when her father is within earshot; and the fact that after Marilyn returns from her failed attempt to break free and continue her studies, she never again cooks from scratch, always has ready-made meals. Those are the kind of little details that are very telling… and yet not over-told. Oh yes, those scenes stand out for me too. The fact that Lydia kept up that pretence for so long, and that her parents had absolutely no idea how friendless she was, was just heartbreaking. And Marilyn’s decision to no longer let her life be ruled by the kitchen was an interesting one… and yet she never told her husband that she really wanted to be a doctor or to have a career outside the home… what was it that made her keep that to herself, I wonder? And you’re right: this book has a quiet, understated style and yet it was rich in detail — I think that’s probably why I enjoyed it so much. What I found so horrifying about this book is that she illustrates how easy it is for a family to completely fall apart. They seemed fine on the surface – the parents thought their kids were doing well, but beneath it all they had their own secrets, none of them communicating them to the others. So, when tragedy struck, they fell apart. It makes you wonder what would happen to your own family in the face of tragedy – are we as tight and connected to each other as we think, or could the same thing happen to us? The added pressures of their interracial marriage, in a time when it was not as common, made things worse for them in the book, but it could just as easily be something else causing tension. It physically hurt me to watch this family fall apart, and I think it’s because it made me realize how easily it could happen, and how desperately I didn’t want it to happen to me. I think you’ve really hit the nail on the head: the ease with which the family falls apart. For so long they appeared, both from the inside and the outside, to be happy and productive, but they were all just kidding themselves, perhaps because no one was free to be themselves: Nath couldn’t get the support he required for his studies, Lydia pretended she had lots of friends and really loved getting chemistry and physics books for Christmas (!! ), Marilyn was never able to voice her desire to have a career and James couldn’t tell his wife how he struggled to fit in. It was just so sad that no one could just be accepted for their true selves, they were all pretending to be something they were not. I bought this book from our local Oxfam the other week confident that it would make the Baileys Longlist . Obvs we now know it didn’t but I am looking forward to reading it soon . Everyone speaks so highly of it . Oh yes, I hadn’t clocked that this would be a contender for the Baileys Prize, but I guess it doesn’t need the marketing boost that a long listing would give it, because it’s so well known and had much success already. This book has been on my radar for a while but I’m interested to see that you didn’t find it super memorable. I think it happens more often than we’d like to admit but we’re not usually aware of it. I love that reading afterglow when you’ve just finished a book you think so highly of. Your review of it is exquisite though, flaws and all. Thanks, Eva. I guess the “memorability” (is that a word?) of a book depends on quite a few things — a strong voice, strong characters etc — as well as the mood you’re in when you read it. Even so, this is a great book and I’m sure you’ll love it if you get around to reading it. I think this is the kind of book I need to take to my in-laws with. Adding to my Kindle today-thank you! I think I might be tempted to agree with you over this. I saw people including this in Bailey’s ‘wishlists’ last week and wondered why, as although good I didn’t remember it as great. Then I checked my blog for last November and found that I’d praised it glowingly, giving 5/5, so obviously I was impressed at the time but it just hasn’t stuck with me either. Curious. Ah well, there you go: we both loved it in the immediate afterglow, it’s just a shame that the glow faded so quickly. I still think this is an impressive novel — filled with so many interesting issues to discuss — and I’ll be keen to see what the author comes up with next. It’s a great book, Laura, and a quick read. Once you start, you get drawn in to this family’s intriguing little world and then you want to stay with them for as long as possible to see what happens to them. I have thought about buying this book for a while, and now you’ve cemented this desire. Wonderful review! Thanks, Alice. It’s a damn fine read, one I’m sure you’ll enjoy if you decide to take the plunge. That’s interesting! I’m waiting for a library copy of this book (have been in the queue since December, which is a record length of time for me, so it must be popular!) I often find that the faster I read a book, the less likely I am to remember it. Sounds like it is a victim of its own compelling nature. I look forward to reading it anyway. I hope I find it as enjoyable as you did. After 3 years I finally got around to picking up a copy of this book which I listened to. I also found it compelling and loved the themes but I did find it a bit too polished. I also had to suspend belief a bit that people in close relationships can have so many secrets from each other – I found the lack of commuication a bit unbelievable to be honest but maybe i am just naive.